This time, we get to hear from a premium client who took a pretty interesting path to get his foot in the door as a consultant. We worked with Aaron for 6 months – who tried unsuccessfully to break into consulting as an experienced hire – and helped him turn rejections into an internship offer at Deloitte after he decided to go get his MBA (courtesy of a full-ride, we might add). His story is especially interesting because he took a unique path – starting with a background in finance and developing a growing interest in consulting in the Asia-Pacific Region, he worked with us to network his way into interviews at top firms in overseas offices, making it consistently to final rounds before falling short of any attractive offers. He decided to take a step back and pursue his MBA – and after making the decision, defied the odds to land a rare pre-MBA internship with Deloitte. Here’s Aaron’s story – from where he started, to how he worked with us on interview prep, and all of the work he did on his own in between. 1. You have a very interesting educational and professional background – can you share a bit about it? Where you are from, education, extracurriculars, previous internships/jobs, interests, etc. My background is in finance. After graduating from a top west coast university, I worked for 2 years at a major investment bank in New York, and then transitioned to the World Bank, a major international financial institution (IFI). With the World Bank, I invested in infrastructure projects in developing countries in Africa, Asia and Latin America. Outside of work, I volunteer with homeless and immigrant communities, organize a recreational soccer team, and compete in endurance sports. 2. You spent several months interviewing with different firms in many offices globally. Can you give us a rundown of your history and experience with interviewing (non-Deloitte)? It took a while to find a consulting job. I was interviewing for jobs in the Asia Pacific region, and I was based in the northeast United States. The biggest challenge was building contacts and setting up interviews. When I started looking for contacts in consulting in the Asia Pacific Region I didn’t know anybody, but I was able to build contacts through friends of friends. When I did get interviews scheduled, I funded travel to the interviews on my own to demonstrate my interest in working in the region. 3. You recently decided to pursue your MBA at a top 20 school. What were the drivers of your decision? I don’t think an MBA is for everyone. However, it made sense for me because I wanted to switch careers. 4. After getting into your MBA program, you pursued a pre-MBA internship with Deloitte Consulting. This is unusual – what gave you the idea to do a pre-MBA internship? I decided to pursue a pre-MBA internship because I wanted to learn more about consulting. I’ve spent a lot of time searching for consulting jobs, but in the end I wasn’t 100% sure that consulting was for me. Deloitte offers a great one month pre-MBA internship. It consists of one week of training and three weeks working on a project. 5. Deloitte is recognized as one of the world’s top professional services firm, and the pathway to an offer differs by region and position. Can you tell us the insider’s view of the interview process for your pre-MBA internship? 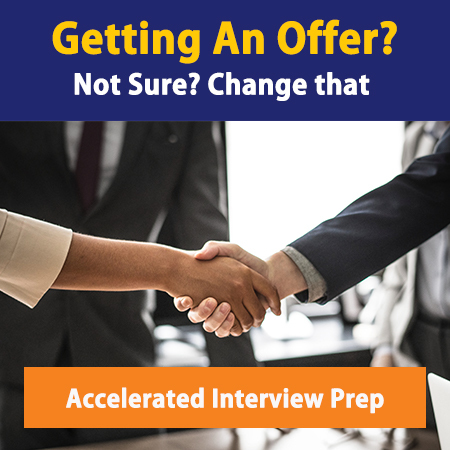 The pre-MBA interview process consisted of 3 fit interviews and 1 case interview. The focus seemed to be on demonstrating clear communication, confidence, and structured thinking. Apparently, I did a good enough job to get the offer! 6. What advice can you give MC readers about breaking into consulting as an experienced hire? Network, network, network. If you don’t know anybody in consulting, check to see if your friends know anybody. Practice as many live cases as possible. Reading cases is important, but not the same as a live case because it doesn’t test your ability to think on your feet. Don’t forget to practice the fit portion of the interview. You need to ace the case and the fit interview questions to get the job offer.